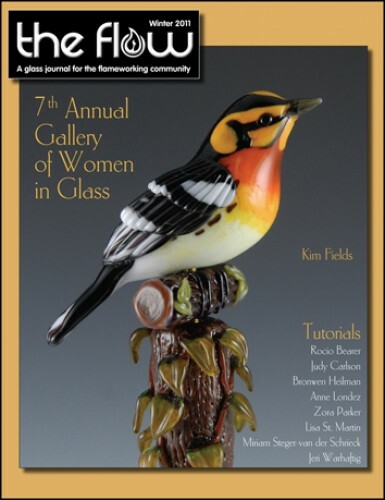 Editor Jennifer Menzies encourages readers to marvel at the beautiful and varied glass art displayed in the Women in Glass gallery and shares a thank-you to the glass artist community for their willingness to give to the world at large, particularly through such projects as the Beads of Courage program that was featured in the Summer 2011 issue of The Flow. 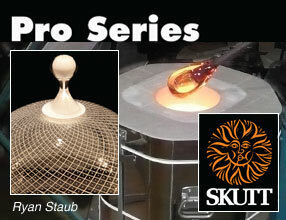 Milon Townsend interviews Amy Schwartz, glass art teacher and director of The Studio at The Corning Museum of Glass. She shares how The Studio has developed through the years to be a leader in the international glass community and a creative resource for the region around Corning, New York, where the museum is located. Each year the Women in Glass gallery gets better, and this year is no exception. Featured in the Winter 2011 issue of The Flow is the exquisite and unique glass art of 172 female glass artists from around the world. Everything animal, vegetable, mineral, and mythological is represented in this stunning collection. This Winter 2011 Glasscraft Emerging Artist Award segment of The Flow features: Hayley Tsang, who spends a great deal of her artistic time exploring silver glass; Ginger E.L.A, winner of awards at the Female Flame Off and Glassroots Art Show and founder of the annual exhibition, For Tobacco Use Only; and Amy Lemaire, who specializes in flameworking with an emphasis on soft glass sculpture, beadmaking, and botanical replication. The Glassroots Art Show presented two days of Flame Off competition and two days of wholesale buying from ninety-five booths, with most artists representing their own work. Male/female teams added an interesting dimension to the timed creations, which featured sculpting, sandblasting, and electroforming techniques incorporated with natural elements such as precious stones and crystals. Marcie Davis interviews Doni Hatz, scientific glassblower who has risen to the top of a field that is generally dominated by male glassblowers. Doni shares her background preparation at the Salem Community College, her work at Proctor & Gamble, and her venture into creating works of art in glass. Information on the latest in new glass types and colors, supplies and tools, kilns, books and patterns, and anything else that glass artists and enthusiasts need for working in hot, warm, and cold glass can be found in the What’s Hot section of The Flow. Miriam Steger-van der Schrieck demonstrates techniques for creating encased beads using Clio rod from Double Helix. 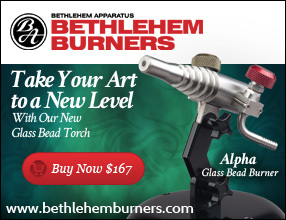 Included are tips for proper flame settings and correct ways to encase the beads for the best results. Judy Carlson demonstrates sculptural techniques for creating beads representative of the puffin birds found in Ireland. Included are tips for making a distinction between the head and body of the bird and for using Intense Black or other nonrunning black for the bird’s back and head. Rocio Bearer demonstrates making a base bead and using various colors of stringers to “paint” on a design done in the style of original cave paintings. Design elements include a stylized bird, geometric line drawings, and other figures from nature. Lisa St. Martin demonstrates creating a long base bead from Clear, White, and Dark Silver Plum glass. Copper Leaf is then used to add a landscape design. Tips are included for using various layers and crinkling the foil to result in different colors in the landscape design. Anne Londez demonstrates using domed punches, a Stump Shaper, blades, and a lentil press to create a volcano-shaped bead. Techniques for shaping the crater using what the artist calls the “crags” technique are included. A pointed glass rod is used to sculpt the sharp edges and points for the finishing touches. Bronwen Heilman demonstrates joining two rods of unknown COEs and pulling stringers to determine whether the two glasses are compatible. When joined together, the stingers from compatible glasses remain fairly straight, while noncompatible glasses curve. The more incompatible the two glasses are, the more curved the line. Arnold Howard explains the principles behind figuring rates per hour for operating kiln controllers and provides formulas for changing minutes to rate per hour. Suggestions on how to have a manufacturer program kilns for a fraction of a degree are also included. Zora Parker demonstrates techniques for creating the basic shape, then rolling it in frit and melting in to create color and texture on the figure. Finishing touches include the addition of hair, a crown, and tail fins.